Last week, we attended the RAN#83 Plenary in Shenzhen, China. 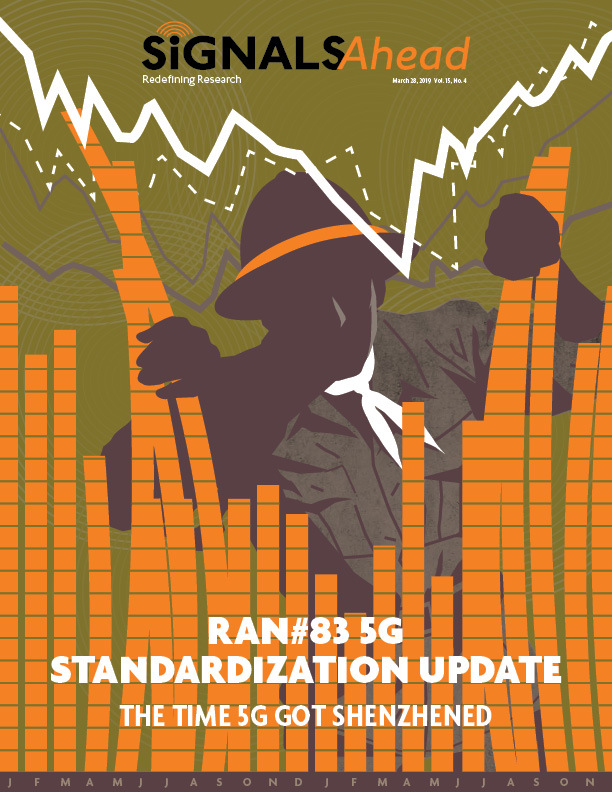 In this Signals Ahead report we provide our thoughts based on recent RAN Plenary activities and key decisions impacting the functionality and timeline of the 5G standard. The Time 5G Got Shenzhened. 3GPP is an international standards body. Like it or not, its success and the success of the telecom industry hinge on the participation of operators and vendors from around the world. Unfortunately, perceived optics about attending a standards meeting in Shenzhen seemingly prevented two major US operators from attending. 3GPP “took a duty” on 5G NR FR2. 5G NR operating in millimeter wave frequencies (FR2) was already challenging enough, especially in the uplink direction. Recent revelations pertaining to how Release 15 must address EMF (electromagnetic field) compliance with a late change request (CR) do not help. Meeting regulatory compliance isn’t the issue. Maintaining good uplink data performance without frequent dropped calls is an issue. We discuss what is being done in R15, would could be done in R16, and how it might impact the first wave of 5G NR devices and network launches. Additional R15 CRs, while critical to the success of 5G NR, are forthcoming, including CRs which address unrelated areas. The V2X “Safety Dance.” With the R16 V2X study item completed, one would think approving the follow-on work item would be relatively straight forward. Unfortunately, there is now uncertainty for the roles that LTE and 5G NR will play when meeting the full set of V2X requirements, including basic safety mechanisms and advanced services. Release 16 and Release 17 Update. We discuss the benefits of recently approved Release 16 work items and the likely timing of Release 17. Odds and Ends. We discuss a couple of items which we found quite interesting and which we’ve covered in earlier Signals Ahead reports.